The Omron E3ZM is a Stainless Steel housing sensor ideal for use in the food industry. The case is made from SUS316L providing strong resistance against detergents, disinfectants and jet liquid flow. The E3ZM sensor is the worlds first IP69K housing for a square metal sensor. Suitable for high temperature, high pressure jet water spray cleaning applications. With the use of SUS316L Stainless Steel for the case and the best material for all parts the E3ZM has achieved 200 times the durability of the E3Z sensor (in 1.5% solution of sodium hydroxide at 70°C) to make the E3ZM suitable for the cleaning conditions of food-processing machinery. Few indentations in the shape means less dust and water can collect, making the E3ZM more hygienic. 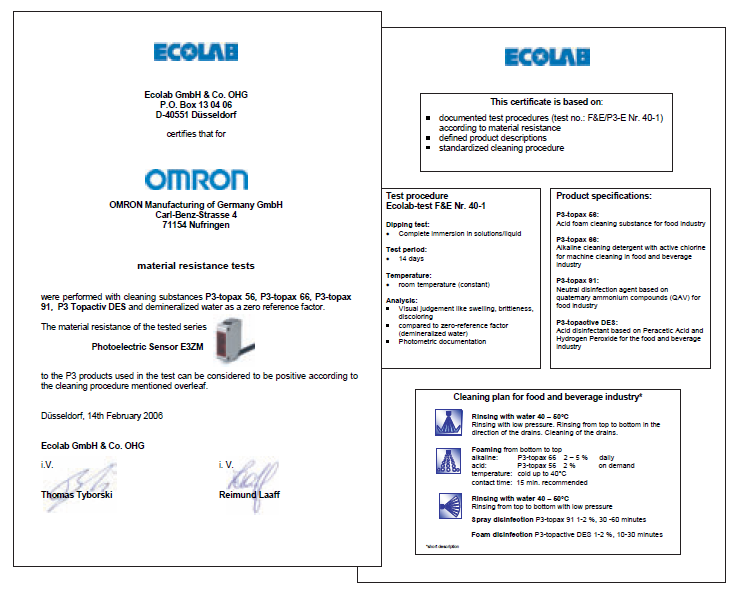 No labels have been used in order to prevent foreign matter contaminating food products. The E3ZM model and lot numbers are imprinted using a laser marker.